New Portland Guide Book – Featuring Cycle PDX! Cycle Portland featured again! – in Portland Family Adventures! Looking for a handy guide book to find your way around Portland? 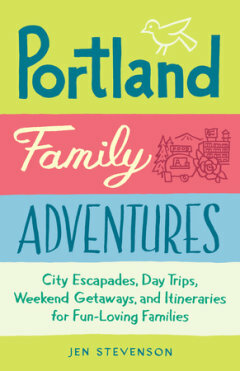 Jen Stevenson’s Portland Family Adventures is the perfect companion for traveling families looking for museums, hikes, tours, and more. With all the guides and recommendations available for visiting Portland, it’s hard to figure out which ones have done the research and exploration necessary to really know our multi-layered city. Stevenson has clearly done that hard work. You can trust her recommendations to steer you to the very best family friendly attractions and activities! Our city tours are another great way to get your bearings and see some of the businesses, monuments, and neighborhoods that make Portland so special. Our guides are always happy to answer questions and give you their advice on their favorite spots around town. You can set up a reservation anytime on our website, or give us a call at 844-PDX-BIKE (844-739-2453) if you have any questions! The Future of Bike Wheels? Tired of spokes, putting air in your tires, and having to pedal your bicycle in the first place? You’re in luck! GeoOrbital has introduced a radical alternative to a standard front wheel, with a fully contained electric motor. The GeoOrbital E-Bike drop-in wheel one of the quickest ways to set your bike up with electric power – all you have to do is put the wheel on and set up the throttle on your handlebars and you’re good to go! The wheel has no spokes, instead the hub remains stationary while the rim rotates around it. This also means the wheel requires very little maintenance beyond regular charging. It never has to be trued, and with sealed bearings and motor components there’s little to no chance of water and grime working its way in. Plus, the tire is filled with foam rather than air, making it immune to flats. GeoOrbital wheels haven’t made it onto our bikes yet, but we do have two models of electric assist bikes available. Stop by any day, or make a reservation on our website, and we can set you up to try one out! The e-bike revolution has to be ridden to be believed. Check the wheel out here. “What to do in Portland,” put Cycle Portland Bike Tours and Rental on your list! Here at Cycle Portland, we love to share a local’s perspective with Portland’s visitors. But even more than that, we love to get people on bikes and out riding! Laura Chubb’s article, “What to do in Portland, From Microbreweries to Third Wave Coffee,” covers all of your Portland essentials. From taking a bike tour around downtown, to window shopping, to the food cart scene, Laura’s list featured on the Independent is an excellent place to start when planning your trip to the Pacific Northwest! Cycle Portland Bike Tours & Rentals specializes in putting together fun, creative rides that are great for people looking to explore Portland, OR by bike! Sign up for Laura’s Essential Portland Tour here! Happy riding! Come down to Cycle Portland tomorrow, December 3rd, 4-7pm, to see the latest hand-warming bar mitts from Portland’s own Lauren Gross. She works to combine scrap waterproof fabrics with insulation and fleece interiors to form a perfect antidote to the drizzly, Pacific Northwest winters. Come by and ask Lauren in-person about her range of creative bar mitts; while you’re here, take the chance to see beautiful bike crafts and the products of a growing number of local bicycle accessory businesses. The bicycle economy in Portland is thriving, catalyzed by the creative design energy that has emerged alongside the bike commuting and racing scene in Oregon. Radical design of fashion helmets, by Nutcase, burst onto the scene to wrestle the torch away from racy helmets and provide another recognizable brand on the market. That unique, innovative energy has been continued in the form of Portland Design Works’ upstart approach to accessories. Taking a formerly-bland essential like water bottle cages to a new artistic height. With their sparrow and owl cages, they bring Portlandia tropes to the bicycle. We work to promote as many of Portland’s bicycle contributors from our PDW range of gear to our collection of jerseys from In Our Heart PDX to the bevy of Nutcase helmets displayed on the walls. Much of our merchandise is even sourced from the Portland distributor Cyclone Bicycle Supply and delivered by Portland’s B-Line’s riders. Portland’s bike economy is much more than an overlooked niche in the bicycling realm; it is quickly morphing into an important contributor to the changing game of bikes. Whether you are outfitting your bike with the essential Kool Stop brake-pads (located in Lake Oswego) or looking for the coolest fenders and ‘bird-on-it’ water bottles, check out some awesome products tomorrow night. Also, check out Red Bat Press block-printed cards. Stop by for a pint of local HUB beer and pick up some Oregon made holiday gifts while you are here. Come by Cycle Portland at 117 NW 2nd Ave between 4 and 7pm tomorrow. Cycle Portland get’s more media love! The word is out! Cycle Portland is a must do on your visit to Portland. Thanks to Suitcase Magazine for giving us a shout out in their September 2015 “Beyond Portlandia” piece. What a great roundup of what the greater Portland area has to offer. Check it out! The Guardian listed Cycle Portland as their recommended bike hire in their “Top 10 Bike-Friendly Wine Routes” article. Yes! -Here’s one for globe-trotting cycling fans and oenophiles – from La Loire à Vélo in France to New Zealand’s Marlborough Wine Trail, a selection of routes that take in some of the best wine regions across the planet – The Guardian. And thanks to Time Out Portland for including us in there “The 20 best things to do in Portland” list. Biking between breweries made #10! Thanks to everyone for getting the word out about Cycle Portland quality! Our season continues to roll strong due to sunny skies, great customer “word of mouth” advertising, and the media articles that keep popping up over the world. It’s been another gangbusters season and we’re getting ready for the holidays with Gift Cards and Accessory Sales. Stop By! Join us Thursday night 5/7/15 for the Cycle Portland Bike Industry Night. This monthly event is FREE, open to the public and highlights a different Bike themed Business. This month we are proud to be hosting Red Bat Press. Join us for a First Thursday celebration of bike business and bike culture with a happy hour style event of conversations related to the Portland Bike Industry. Red Bat Press’s release of “Hidden Portland’s 2015 Museums & Collections guide” will kick off the evening from 4:30-7:00PM. Purchase $5 or more from Red Bat Press, AND GET A FREE BEER! 4:30-7pm. 117 NW 2nd Ave. Portland, Ore. Thanks to Hopworks Brewing- Oregon’s first all organic brewery – for sponsoring Cycle Portland. Thanks to our friends over at The Johnston Law firm for putting this infographic together. Cycle Portland comes out on top for Portland’s cheapest all day bike rental. We strive to provide the best value in Portland when it comes to the bike business so stop on by! Anyone living in Portland knows how popular bicycle riding has become for commuting to work, sight seeing or just getting around town. Join in on the fun for any reason, or no reason at all! If you don’t have a bicycle, you can rent a wide variety of bikes for just about any duration. Since most find the common “city bike” perfectly suitable for getting from point A to B, we set out to find the cheapest full day rental for a city bike this season and here’s what we found.